We now move to the other side of the band. In the key of Bb again, we are now starting to enter the world of the larger instruments. The baritone produces a mellow sound a bit like a tenor horn, but lower. Together with the tenor horns and the back row cornets, it is often argued that these instruments form the backbone of the band, as they produce the "middle sound" that gives a brass band its distinctive sound. The principal often plays little solos, sometimes accompanied by the back row cornets. 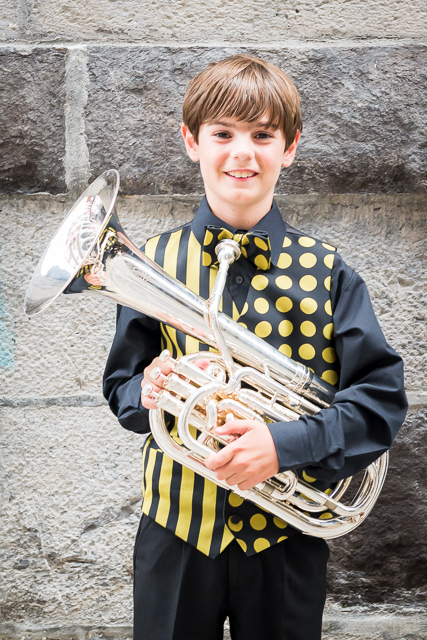 There are usually two baritones in a brass band, although youth bands often have more. The baritone is occasionally seen outside brass bands. Along with the cornet, this is perhaps one of the most well-known instruments in the band. In the key of Bb, it is the first of the tuba family, as it is really a mini-bass, and gives the band it's deep, rich sound. There is lots of brass band music that features the euphonium. Some would say that the euphonium is especially suited to slow, melodic ballads, where it does indeed fit very well. However, it is a very versatile instrument, and a good euphonium player can easily turn his or her hand to very fast pieces, including swing and jazz! 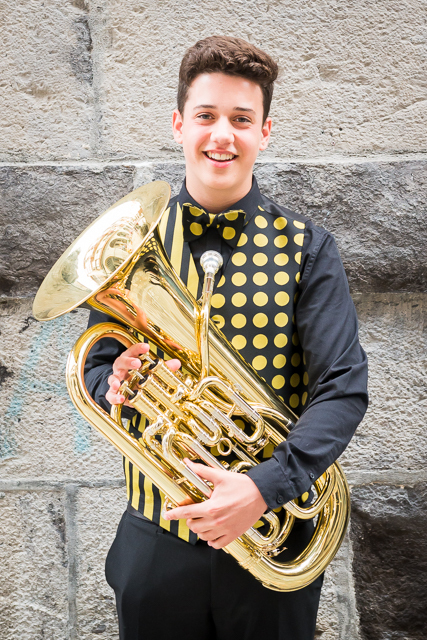 The principal very commonly has solos, and enjoys almost as much musical exposure as the principal cornet! Sitting on the end of the row nearest the audience, again like the principal cornet it is a very "visually exposed" position. Our band currently has four, the norm being two, but often more particularly with youth bands. The euphonium is another instrument that enjoys use in many other types of band and orchestras.